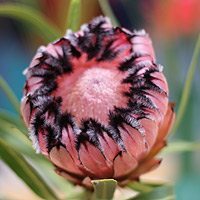 Protea plants and species grown for the attractive flowers and are available for sale online, as well from good retail nurseries. These are one of the oldest groups of flowering plants. Naturally found in the southern and south western coastal mountain ranges of South Africa and along the southern and south western coastal areas of Australia. 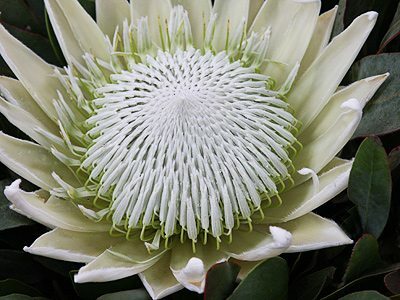 Popular species include P.nerifolia, P.repens, P.cynaroides or ‘King protea’ and P. magnifica. Species such as P. cyranoides, which is one of the largest and most spectacular flowering species are popular, as are the many new named cultivars that have been released over the years. 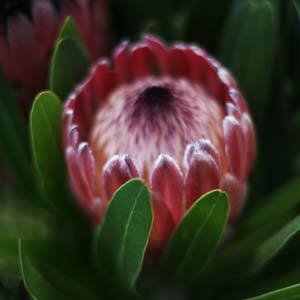 New Dwarf Protea varieties are also available. It is interesting that no genus is common to both Countries. Colorful and tough, protea are long flowering and easy to grow, however the genus is larger and worth exploring. 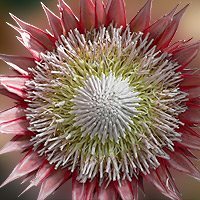 Leucodendron – Large colourful bracts are the showy part, they actually conceal the flower at the tip in red, yellow and orange. Leucospermum – Large pincushion like flowers with long conspicuous styles protruding from the flower head. Serruria – Usually fine leaves with small hairy flowers partially concealed by colourful bracts. All require an open sunny position and excellent drainage. They grow well in poor soils and tolerate coastal conditions well. Nearly all are drought tolerant once established. All are very low care, pruning after flowering each year is all that they really need. All varieties are hardy and require little water once established in the garden, they do need good drainage and plenty of sun. They can be pruned by cutting back spent flower heads, do not prune the none flowering shoots, these are next years flowers. They are best planted in a separate garden bed to other plants as they do require a different fertilisation and watering regime many to others. Potted plants will require regular water, but a free draining potting mix. Fertilize potted plants with a slow release Australian Native Plant Fertilizer (these are low phosphorous). The easiest way to propagate protea is from cuttings. Choose tip cuttings around 8cm long, removed with sterile secateures. Remove the lower foliage, leaving the new growing tip and at least 1 set of other leaves. Dip the stem in a hormone rooting powder or some honey. Insert cutting into a free draining potting mix. Cover with a cloche, plastic bag or soft drink bottle with the bottom removed. Keep just moist.Mist spray on warm days. Keep in filtered light, not direct sun.